"Hey there, how's your day going", I asked him. "Um Sweetie, you're in a people profession". "LOL, poor baby, I'm sorry". "I'm gonna become a pirate". 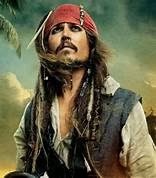 "Laughing still, why a pirate". "When people piss me off, I can just make them walk the plank". "Mean pirate", I texted back laughing. The next day, I text him again to ask how is day is going. "Well, that is why they call it WORK and not PLAY"
"And that's why I'm gonna be a pirate. Work be play". And on another day, he texted me, "I'm running away to the islands. Wanna come?" "Sure, how long are we staying?" "How we going to live? This girl's got to eat". "I told you - I'm gonna be a pirate". "You just want to plunder and pillage and ravish the wenches". "Tis a pirate's life fer me!!!" 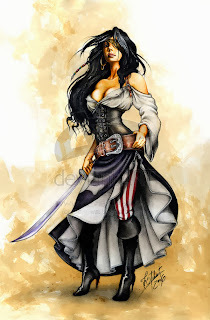 Hmm, if I'm dating a pirate - does that mean I'm a wench? Laughing. You are only a wench if he has to chase you around a water fountain at disneyworld for a few months. Then you qualify. How does he look in an eye-patch? More importantly, how do YOU look in an eyepatch? Merry Christmas Sunshine and a Happy New Year!